8 March, 2012. It was a Thursday. This is the second installment to the RabbitMQ for Windows series. In our first installment, we walked through getting RabbitMQ installed on a Microsoft Windows machine. In this installment, we’ll discuss a few high-level concepts and walk through creating our first RabbitMQ application. To being, let’s discuss a few basic concepts. Each of the examples we’ll be working through will have two roles represented: a Producer and a Consumer. A Producer sends messages and a Consumer receives messages. Messages are sent to Queues. 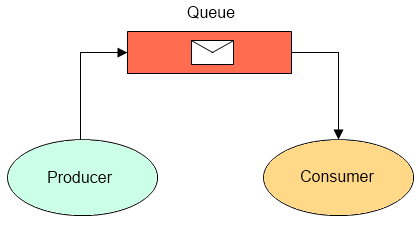 A Queue is a First-In-First-Out (FIFO) data structure. You can think of a queue as a sort of pipe where you put messages in one side of the pipe and the messages arrive at the other end of the pipe. We’ll introduce other concepts further into the series, but that’s the basics. Let’s move on to creating our first example. Our first application will be an obligatory “Hello World” example. We’ll create a Publisher application which sends the string “Hello, World!” to a RabbitMQ queue and a Consumer application which receives the message from the queue and displays it to the console. To start, let’s create a new empty solution named HelloWorldExample (File->New->Project->Other Project Types->Visual Studio Solutions->Blank Solution). Once you have that created, add a new project of type “Console Application” to the solution and name it “Producer”. Next, add a reference to the RabbitMQ.Client.dll assembly. The ConnectionFactory has a number of properties that can be set for our connection. In this example, we’re establishing a connection using the default connection settings which assumes you have the RabbitMQ Windows service running on your local development machine. If you’ve installed it on a different machine then you’ll need to set the Host property of the connectionFactory instance to the DNS name where you’ve installed RabbitMQ. A channel is a light-weight connection which RabbitMQ uses to enable multiple threads of communication over a single TCP/IP socket. Note that the actual type created is RabbitMQ.Client.IModel. In most RabbitMQ client libraries the term channel is used, but for some reason the authors of the .Net client library chose to use the term “Model”. Descriptive, eh? We’ll use the instance name of “channel” to be more descriptive. This creates a queue on the server named “hello-world-queue” which is non-durable (won’t survive a server restart), is non- exclusive (other channels can connect to the same queue), and is not auto-deleted once it’s no longer being used. We’ll discuss these parameters in more detail further in our series. Again, don’t worry about understanding the parameters just yet. We’ll get to that soon enough. Congratulations! You’ve just completed your first RabbitMQ application. Next time, we’ll take a closer look at the concepts used within our Hello World example.